Home > Ask Our Experts > National Rail: Is it Failing Pensioners? Q.National Rail Senior Railcards are now available for three years as well as one year.The three year card is only available online. When you try to purchase one, even if it is a renewal, you are required to provide either a passport number or a driving licence number. Many senior people in this age group, myself for one, do not have a passport, access to a computer or a car. I feel we are not being given equal opportunities that others are. According to the National Rail Website, "to buy online" consumers must provide a driving licence or passport number as proof of eligibility (that is, age) for the Senior Railcard. This makes sense given that if there was no standard for eligibility then theoretically anyone could purchase a Senior Railcard and avail of the discount. However, it also suggests that consumers are able to purchase Senior Railcards from outlets other than the National Rail website. According to the Senior Railcard website this is absolutely the case. According to this site, seniors can also purchase railcards from staffed ticket offices, National Rail licensed travel agents and over the phone. Birth certificates are accepted as proof of age in addition to drivers licence and passport numbers from some of these outlets. However, it is true that the three year card is only available online and so consumers must have internet access as well as a drivers license or passport number to register for it. The price difference between buying three consecutive yearly Senior Railcards and one three year Senior Railcard is £20 at present. 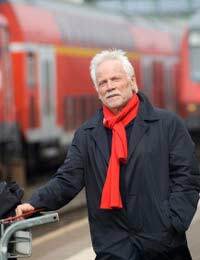 It could be argued that in fact the only thing seniors are missing out on by not ordering the three year card online is the monetary savings, but that there is not a reduction in service or opportunities due to this application process because Senior Railcards are still available from other outlets with different application processes. It is obvious that you feel differently. In order to make sure that your thoughts are made known, write to Senior Railcard at ATOC, 3rd Floor, 40 Bernard Street, London, WC1N 1BY with your questions and concerns. Alternatively, write to National Rail at National Rail Enquiries, Customer Relations, Freepost RRLH-GGCC-SCRE, Rotherham, S97 3ZX to ask them about the Senior Railcard procedures and voice your displeasure with the application processes. Though it may not seem fair that consumers must take on this extra task it is often the case that when they make their feelings known they can affect significant change. To make sure that your voice is not lost, encourage family and friends to write in about this matter with you. The more questions or complaints that an organisation receives about a particular issue the more likely they may be to review it and make changes. Why do BR charge both me and my husband for a senior railcard each when families only need to buy one?